The Boston Globe recently launched GRANT, a new subscriber-driven community program. 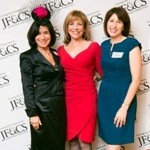 I have been thinking about the generations JF&CS has helped since it began 150 years ago. When five-year-old Cole and his loving parents came to JF&CS, they faced several challenges. The CHAI Celebration in November brought together more than 200 supporters.